It’s springtime! The days are much longer and the weather is getting better, this makes it a lot easier to have a good attitude about getting up in the morning and makes the odd open water session a possibility. I recently rejoined Fermoy SC. Now, someone else has to decide where, when, and for how long I swim! Someone will also be cross if I don’t turn up for training. It’s hard to imagine the difference that this makes – I now find it a hundred times easier to train just because I don’t have to think or plan, I just do what I’m told! I have great admiration for everyone that can motivate and organise themselves to train. It’s “study month” at UCC – that month (April) that UCC students are given off to study for the end-of-year written exams in May (only three weeks for my course as we have an extra field module in April). This means that I don’t have to waste upwards of 2 hours and some energy sitting on a bus doing nothing. More time/energy for swimming! Fig. 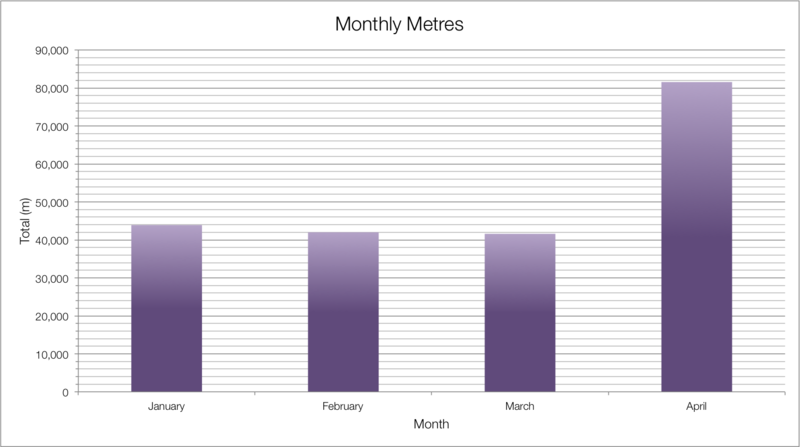 1 – Monthly metres for 2013 as at 28 April. One of my major issues last year was that I took off like mad right at the beginning of the year, I built up very quickly from a <5 km week (with not a lot of base training from 2011) to a >50 km week in just one month and then very quickly crashed and burned. I got quite sick and demotivated and could hardly swim for a few weeks, and even when I did start back it was a slow start and never really went anywhere for the rest of the year. This year has been very different: I started off slowly (from a good base of swimming in late 2012) and had two strange up-down cycles but have now started to maintain modest but more consistent mileage which, I might add, consists of much better quality training than anything that I did last year. You can see the comparison between my weekly training distances from 2012 and 2013 in Fig. 2 (below). Fig. 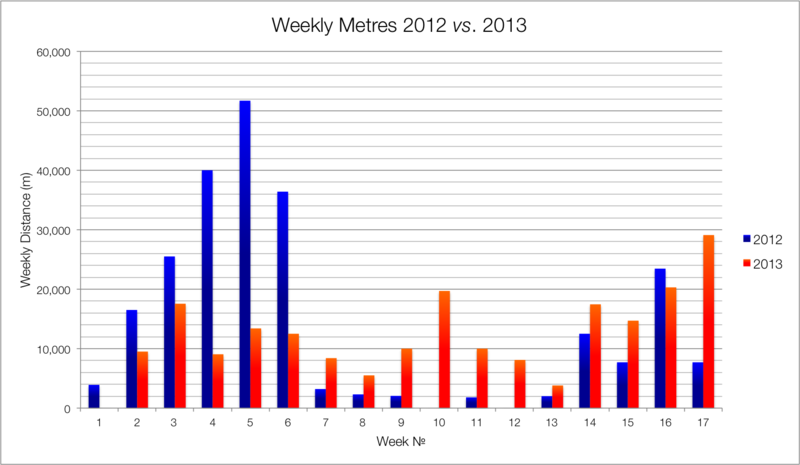 2 – Comparison of Weeks 1 to 17 from 2012 and 2013. Now, with the water warming up and the long days, open water can start to contribute much more to my training. I have easy access to open water with the River Blackwater and Knockananig Reservoir right on my doorstep – both of these are “open all hours” venues and are free of charge so I intend to make great use of them! Also, my open water training should be of much better quality than ever before with my new FINIS Hydro Tracker GPS which I’ve been testing over the last week or so. In Fig. 3 (below), you can see my early burst of training in January 2012 and the subsequent plateau where I became unwell contrasted with this year’s steadier climb. I’d hope to catch up with myself at some point in June (when I will be attempting my 6 hour qualifying swim for my Round Jersey Solo in July) and continue with both pool and open water training for the rest of the summer. Fig. 3 – Accumulation of metres for 2012 and 2013. Tip: Never underestimate the power of Microsoft Excel as an analytical training aid! I arrived at the pool early, having driven across Sliabh Luachra, and armed with a day’s supply of wine gums (a gala essential). Once the gang from Dolphin SC, with whom I would be hanging out for the day as I was the sole representative from Fermoy SC, we started the warm up. I never manage much of a warm up at galas and this wasn’t an exception. I finished up after about 850 m, but wasn’t the first so didn’t feel too guilty! My first event was the 400 m freestyle – my personal best (PB) for this event is 4:39.90 but that’s a very old time which I aspire to break at some juncture. I was placed in Lane 3 of my heat with two 52-year-olds on either side of me and Carol Cashell in Lane 1. It was a great race, I felt much better than my last 400 m at Mallow Masters late last year. I finished up with a 4:55.25 which, while not great, I was reasonably happy with as it was ~5 s faster than my swim at Mallow. Carol finished with a 5:07 which was faster than her seed time but she felt she could have been faster as she was suffering from a head cold. There was a huge spread put on for the break, which may have been the downfall of a lot of the swimmers for the afternoon session! I only had two events left: the 200 m freestyle and the 100 m backstroke. My 200 m freestyle performance was not great, as usual. I swam a 2:22.25 which is a good 10 s off my PB. I’ve never liked the 200 m anyway as it’s not an all-out sprint like the 100 m but not a distance event like the 400 m either so I’m never sure of how to approach it. My 100 m backstroke time was a bit off as well at 1:16.48, my PB is 1:13.50, but I still enjoyed it as I always enjoy swimming backstroke even if it’s not that fast for me. In total I came away with four gold medals and one silver (no, the 19-24 age group os not the most competitive in Irish masters swimming). The silver was in the 100 m backstroke and I lost out to Arif Yilmaz of Mallow Masters SC who posted a 1:03.62 (yes, faster than my 100 m freestyle time that day) so I wasn’t too put out! It was a great gala, good fun and very well organised, well done to Kingdom Masters SC. 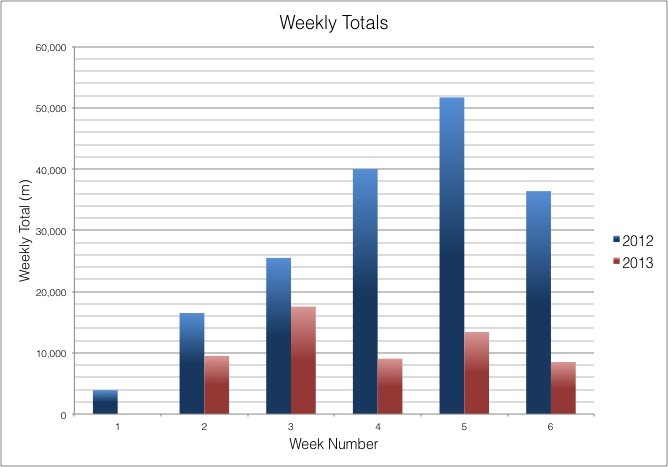 Clustered bar chart of Weekly Totals (m) for Weeks 1 to 6 of 2012 and 2013. 2011 was a bit of an off year for me with my Leaving Certificate exams in June and my first semester at University College Cork from September to December. In January 2012, I found myself unexpectedly climbing up the mileage ladder on an almost daily basis. The fourth week of January was a 40 km week, which was a good week for me even when training for my English Channel swim in 2009. The next week, I managed over 50 km, including a 25 km pool swim on my birthday and a lap of Sandycove Island. This was my longest week ever! Since the middle of September 2012, my training has been lower in volume but I’ve been much more consistent and have been getting more value out of it. From the chart above, I’ve been doing very little until now (with college work, etc.) but I won’t be crashing and burning as I did last year. Hopefully, this will stand to me in the long run! We often talk about the contribution that people have made to the life of open water swimming, but seldom about the contribution that open water swimming has made to the lives of people. Today, I think, is a good day for me to reflect on the contribution that open water swimming has made to my life. I was lucky, though. I was very fortunate to have a grandfather, Tom Baker, who was – and still is – very enthusiastic about swimming. Though never having swum very seriously himself, he is well known in Fermoy for his long-standing summer ritual of swimming in the River Blackwater twice a day, Monday to Saturday, and in the sea at Ballycotton on a Sunday. In 2006, his friend, Leo Bartley, another regular Blackwater swimmer, asked me if I would like to do the “Vibes & Scribes” Lee Swim in Cork City. After some cajoling, I eventually decided that I would give it a try. A friend of mine from Fermoy SC, Bryan Dillon, agreed to join me for that first Lee Swim. Before we could register for the event, we had to go to Sandycove to prove that we could swim. There we met the great Ned Denison and had a great swim around Sandycove. After doing the Lee Swim, I was completely hooked on open water swimming and had a great time swimming through the best Irish summer in recent years. Swimming was the only sport that I was good at and open water was the only thing that I [relatively speaking] excelled at. My six and a half years open water swimming has been of incalculable benefit to me and I genuinely cannot imagine life without this sport and the people in it. Because open water has given me so much, I have always tried to make other young swimmers aware of it’s existence. There are many talented young swimmers, who find that racing in the pool is not for them, whose lives could be greatly enhanced by finding their niche in the open water. I was one of those swimmers (okay, maybe not so much the talented bit) and it pains me to think that a few swimmers are being actively discouraged from exploring this avenue of swimming, but that is a whole other post! For today, I’m just thankful for having this sport in my life. 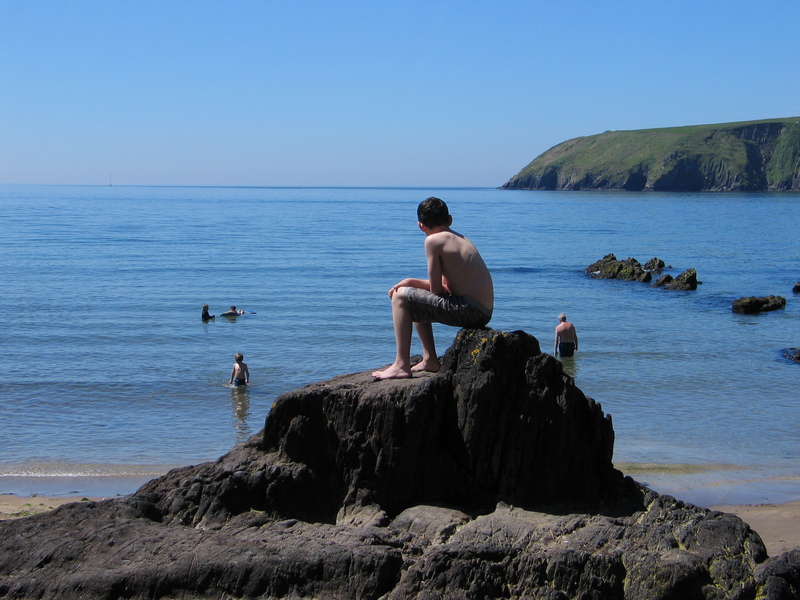 The above photograph (that’s me sitting on the big rock) was taken by my father, George O’Keefe, at Trá na Binne Báine (Beenbane Strand) near Dingle, Co. Kerry in June 2006, just one month before my first open water event. I think it encapsulates the theme of today’s post very well and it’s an image that I often come back to. On very good advice from Donal Buckley, it’s to the boy in that photograph that I write posts like this one.